Have you noticed we are adding more fixtures that are not live on television? If you don't want to see these additional matches, you can now upgrade to our Premier version and remove them from your schedules, leaving you with just the matches that are live on TV in the UK. 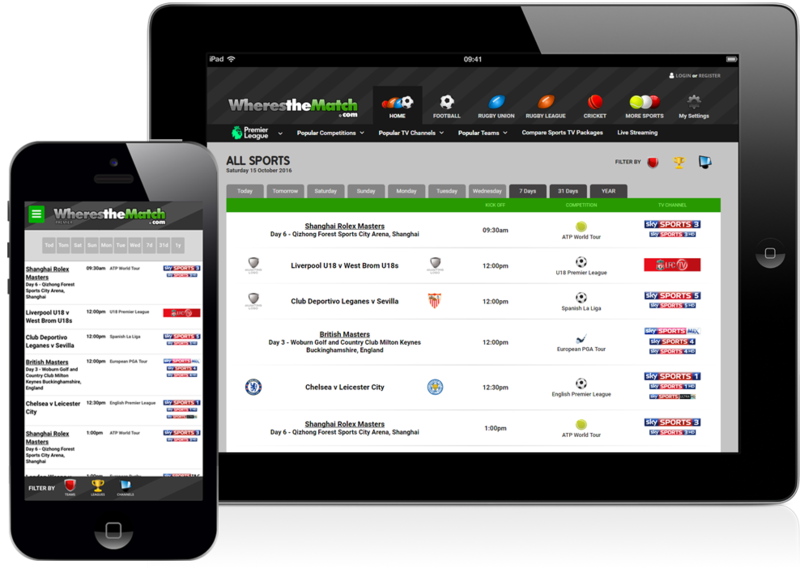 Save hours every week searching multiple websites, complicated TV guides and news articles - we are the only UK Live sports schedule aggregator! Football, Rugby Union, Rugby League, Cricket, Tennis, Formula One, Golf, Moto GP, Boxing, Snooker, Cycling, Darts, Motorsport, American Football, Basketball, Baseball, Ice Hockey, Pool, Athletics, Badminton, Speedway, Bowls, Horse Racing, Swimming, Squash, WWE, UFC, Winter Sports, Gymnastics, Table Tennis, Netball, Aussie Rules & GAA. As part of your Premier subscription, you get a version of WherestheMatch.com that is completely advert-free! No more annoying pop-ups, pop-under offers, site interstitials, overlays or distracting banner advertisements - use our glossy, ad-free Premier interface on your desktop, tablet and mobile device. Take advantage of a much quicker loading website and a much better user experience on your mobile device when checking your schedules on the go!